← Got good or bad news about your Museums at Night event? Just a few days to go till Museums at Night 2013 kicks off on Thursday 16 May! 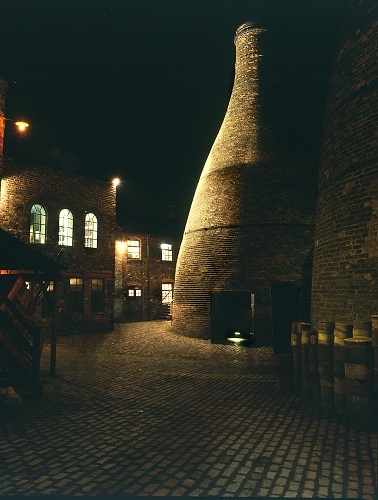 Our latest Museums at Night guest post is by Nerys Williams, who discusses Gladstone Pottery Museum’s first ever Museums at Night event. 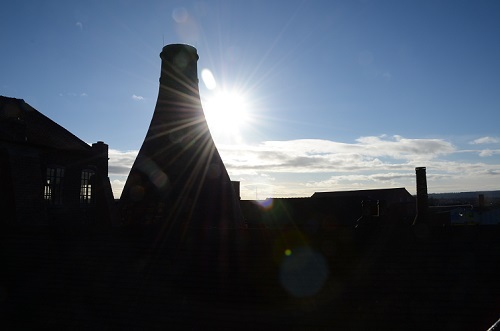 The sun sets behind the bottle oven at Gladstone Pottery Museum. We haven’t taken part in Museums At Night before and I’m busy planning our first ever foray into this new and exciting territory. This is thanks to a bursary from Culture24 for being runner up in the Connect10 competition, another first for me which had surprisingly wonderful results. For some time I’ve been working with local artists who will be putting on a multimedia extravaganza at our site this September. They seemed the ideal people to help with an after hours event and are a fab bunch of creative, positive types who immediately set about planning something very special. My humble (and fairly simple to carry out, but bang went that idea….) plans for an evening opening went out the window within about 30 seconds of our first meeting. ‘A Night At The Kiln’ quickly took shape and will be an evening of music, poetry, art and film on Thursday 16 May. Scores have been composed, the line-up grew and grew and it promises to be a really good ‘do’. The iconic bottle oven at Gladstone Pottery Museum. A trombonist will be playing in one of our bottle ovens. Iconic is a word so overused you can almost hear it creaking from the weight of hyperbole loaded upon it – but bottle ovens really do deserve this accolade. They’re huge, imposing brick structures once used to fire pottery. To have musicians playing a piece inspired by the pottery industry inside one is an exciting prospect. Coincidentally they also have ace acoustics. Internationally renowned soprano Denise Leigh has kindly agreed to sing at the event – I’m still a little stunned by this! Putting an opera star under the stars at our site for Museums at Night was beyond my imagination (or contact list). Along with piano, clarinet, harmonica, singing children and poetry there’s a lot of material in the programme written about our local heritage. We even have a ‘spit’ poet. Not being as ‘down with the kids’ as I thought I was, this had to be explained to me – for any others who are looking blank it’s a bit like rap. Local artist Rob Pointon will be painting it all as it happens. It’s good for me to work with artists who put creative impact first and practical concerns further down the list. I do occasionally have to urge to stand on a table and demand lists and risk assessments in a matronly voice but our Museums at Night event is making me realise what can be achieved with willing partners. I have vetoed the Chinese lanterns though. My worry that they’d land on something/someone causing a flaming fireball and blackening the museum’s name with metaphorical soot forever, was too much for me to bear. Even with my newfound fondness for the lovable but as-difficult-to-herd-as-cats art world, I have to draw the line somewhere! 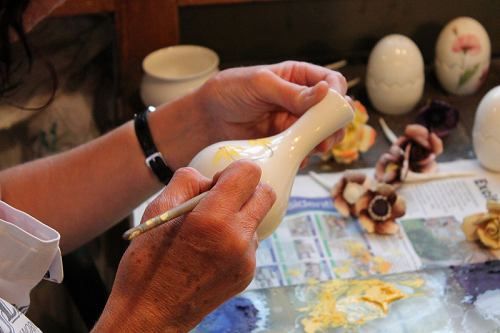 An example of the pottery painting at Gladstone Pottery Museum. It’s back to the practicalities for me now, with press releases to write, posters to produce and a full on assault on social media to complete. Come and join us! Tickets are £5 which includes a glass of wine or fruit juice, and can bought in person from Gladstone Pottery Museum or by calling 01782 237777. Doors open at 7.15pm. For more information on Gladstone see www.stokemuseums.org.uk or our Gladstone Pottery Museum Facebook page. Nerys Williams is the Audience Development Officer for Gladstone, is passionate about the site and fond of industrial heritage and cake. She plans and publicises events of all types, from the International Marquetry Exhibition to making Pigoons (balloon pigs) during half term. 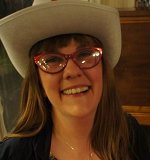 Nerys loves the variety of her job – she can be organising a book signing by a local author one day and discussing turning circles and timetables for a classic bus rally the next. Museum life is never boring. If you’re reading this and you have an interesting story to tell or case study to share about planning or marketing after-hours events at your arts or heritage venue, I’d love to publish your guest posts as well. Please email rosie@culture24.org.uk. This entry was posted in Guest post and tagged event, event ideas, Guest post, Museums at Night 2013, performance. Bookmark the permalink. I was the “spit poet” that performed at the event. It was a great show from start to finish. I can’t wait for the next one at Gladstone. So glad it went well – sounds a really interesting event!